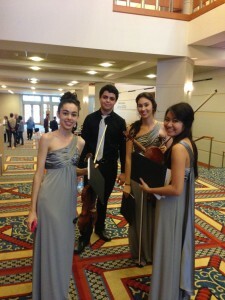 Did you know we have a prize-winning string quartet here in Naples? It’s the Anderson String Quartet, comprised of principal players from the Naples Youth Philharmonic who are also current and past prize winners of our Club’s Scholarship Competition. They recently return from the University of Notre Dame in South Bend, Indiana, where they competed, along with 23 other ensembles from across the nation, as quarterfinalists in the 2014 Fischoff National Chamber Music Competition. We supported the quartet by promoting and attending their recent fundraiser, and received the following letter from them. What an incredible time we had at the Fischoff Competition in South Bend, Indiana! We truly appreciate all of the support and encouragement that The Naples Music Club has shown us, that I thought I would write you a note to follow up on our trip, and to share all of the amazing experiences that our quartet had together! Every day was filled with fun and hard work, starting with our six hour trip up to South Bend on Thursday morning. We received quite the special treatment toting around all of our instruments, including the usual problems traveling with a cello. It’s definitely more interesting traveling as a group! Notre Dame is such a beautiful University. After taking a little time to explore the campus, we went straight to the practice rooms to prepare for our competition the next day at 11:30am. Friday morning came quickly and our day started off with check-in and a 9am rehearsal. From the moment we arrived, it was fun to see the other ensembles in their carefully coordinated ties and gowns, which added an elegance to the electric atmosphere. Shortly after, we were escorted to the green room. Once we were handed our excerpts, we frantically bracketed our music and ran through each selection. It was now our turn to enter the stage in Philbin Theatre … finally! All of our preparation and hard work had now paid off, thanks to JT preparing us so well. We all felt it was one of our best performances no matter what the outcome. An hour later, we were whisked away to Liberty Elementary School to participate in the Peer Ambassadors for Chamber Music Program (PACMan). This particular elementary school does not have a music program, so we gave them a mini concert to introduce the string family. These 2nd and 3rd graders really enjoyed our excerpts demonstrating pizzicato and dynamics, as well as some contemporary pieces. All of these students were so responsive and energetic towards our program that I’m sure we must have made a positive impact on many of them. We are so glad that we volunteered for this event, making or our trip extra special! We then enjoyed the rest of Friday, cheering on our favorite ensembles as the competition progressed into the night. All of the other 23 junior ensembles were just phenomenal! Which is why we were not surprised to find out Saturday morning that we did not make it to the semi-finals. And we were shocked to find out which other AMAZING chamber groups did not advance either! At this point we felt truly honored to be considered among the best high school chamber groups in the country chosen to come to Fischoff this year. This was a huge privilege, and an experience we will never forget! The festivities closed with an ice cream social on Saturday night. Here we were able to meet and speak with the judges again about our performances. They were always so encouraging and insightful, reminding us again how difficult it was to choose their finalists. After this incredible weekend full of practicing, performing and master classes, each one of us in the Anderson String Quartet felt like winners too! Thank you again for your overwhelming support and encouragement. We couldn’t have come this far without you !